Dengue is transmitted diseases which occur by mosquito bites. 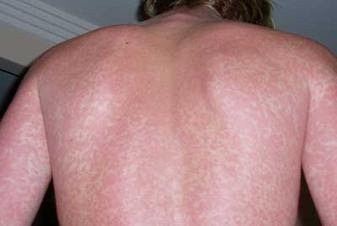 Skin rashes come twice in dengue. First it comes when you have fever and secondly it comes after the fever. The first signs of the disease appear in most people while second signs do not appear to everyone. The rashes create many problems. It creates itching and after that skin become dry. There is no way of preventing when you have dengue. But you can do such remedy after when you recover from dengue. You can use lotion and some cream to overcome from the rashes. Coconut Oil: Take coconut oil and put them on the rashes which occur due to dengue. If the itching is on the body then take the shower with warm water and apply coconut oil on your entire body. Baking Soda: If your itching is limited to a certain place, then the baking soda is the best option. Mix baking soda in the amount 3:1 ratio in water and apply it on your itching place. You can also put it in warm water and take shower from it. However, you should avoid if the skin is broken or a wound on it. Basil: Basil is very useful in itching of dengue. It contains camphor, yugnal and thaymol so it reduces inflammation of the skin. Take basil leaf and wash it properly. Put it on itching area and you will get instant relief. You can dipped cotton in to basil tea and put it on itching area. It makes your skin smooth and removes itching. Aloe Vera: It is vital remedy because it contains anti-fungal, anti-bacterial, emollient and anti-inflammatory elements. It makes skin soft and it is very useful when skin has red rashes or itching. Apple Cider Vinegar: Raw apple cider vinegar relieves the itching of the skin. The acid contains such properties which fight with the infection of skin. It is effective in skin itching.